Sounds like a lot of work but well worth it. 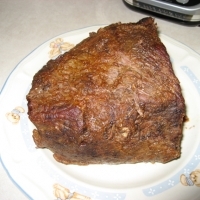 Allow the roast to set out for 30-60 minutes to come to room temperature. Using the tip of a sharp paring knife, make 10 to 12 evenly spaced small slits about 1 1/2-inches deep all over the roast. Using your fingers, insert the peeled garlic cloves as deep into the meat as possible. Cover all sides of the roast with Olive oil and massage the oil into meat. Season the roast evenly on all sides with the kosher salt. Sear on all sides of the roast until well browned. (About 4 to 6 minutes per side) Don't be afraid to let the roast get very brown, this is where a lot of the flavor comes from. 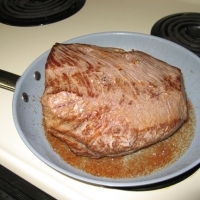 When the roast is evenly browned on all sides, remove it to a plate and set aside to cool (for about 10 minutes). After the roast cools, season it evenly on all sides with the Worcestershire sauce, Paprika and Cajun Seasoning Mix. Rub the seasonings into the roast real good. Transfer the roast to a large piece of heavy-duty aluminum foil and make a pouch around the roast sealing it tightly while leaving an air pocket on the top inside. Place the package onto a strong backing sheet and put into a cold oven on the middle rack. Turn the oven on to 250 degrees F and cook for 4 hours. Do not open the oven door while cooking! 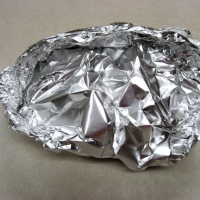 When finished cooking, remove the foil pack from the oven and carefully poke a hole into it to relive any steam and then carefully cut open the top of the foil pack. 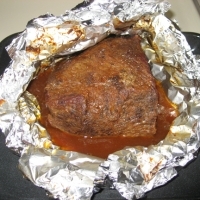 Transfer the roast from the foil pack to a plate and cover with aluminum foil. In a 2 qt. 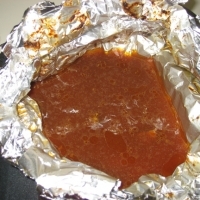 sauce pan, transfer all of the drippings from the foil pack. Cut a small onion into quarters and add to the drippings. Into the beef broth, add 2 heaping tablespoons of corn starch and dissolve very well. Slowly add the broth to the sauce pan while stirring. Add the Kitchen bouquet to the sauce pan. While stirring constantly, bring up heat on the sauce pan to a low boil and boil until the gravy is to the desired thickness. Lower the heat and simmer for 10 minutes. 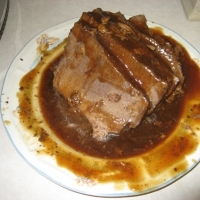 Slice roast, cover with gravy and enjoy. 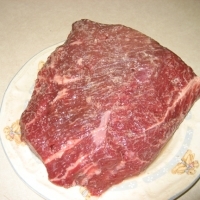 this was THE BEST Chuck Roast i've ever had!! Wonderful! Can't wait to try this one. Love the seasonings. And a little trick my mom taught me with the cornstarch...dissolve it in a little bit of water, then stir into the gravy...even quicker and no chance of a lump anywhere. Great recipe, Donny! Love your step-by-step pics and the seasonings are awesome here! can't wait to try this! 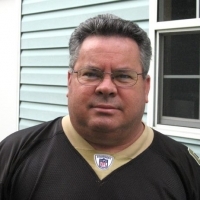 Thanks, donman. My five to you and have a Merry Christmas! This sounds really good, Donman. I like the way you stream it slowly in a low oven. I'll bet it's very tender.